Innovative Transport Solutions (iTrans) Private Limited is an Urban Transport consultancy. An incubation unit in the Indian Institute of Technology Delhi (IIT Delhi) from 2008 to 2012, we work on Sustainable Urban Transport issues ranging from Urban Transport Policies at the National and State Level, Transport Planning and Modelling at city level, Non-Motorised Transport Planning, Advocacy and Promotion, Public Transport Planning and operations with special focus on Bus Rapid Transit Systems (BRTS), Area level traffic circulation plans and Microscopic Simulation studies. Innovative Transport Solutions Private Limited (iTrans) has a Memorandum of Understanding (MoU) with organisations like Indian Institiute of Technology Delhi (IIT Delhi), Urban Mass Transit Company (UMTC) Ltd., SG Architects (SGA), PricewaterhouseCoopers(PwC) Ltd., Deloitte India Ltd. and the IBI group as a part of various projects. Our expertise on various urban transport issues helped in working with wide ranging clients on projects at different levels of the sustainable transport hierarchy. These include transport policy projects like providing technical assistance to Phase-2 of the Jawaharlal Nehru Urban Renewal Mission (JNNURM) which is at the national level, Preparation of Haryana Vision-2030 for Urban Transport, which is at the state level where we worked with PricewaterhouseCoopers Pvt. 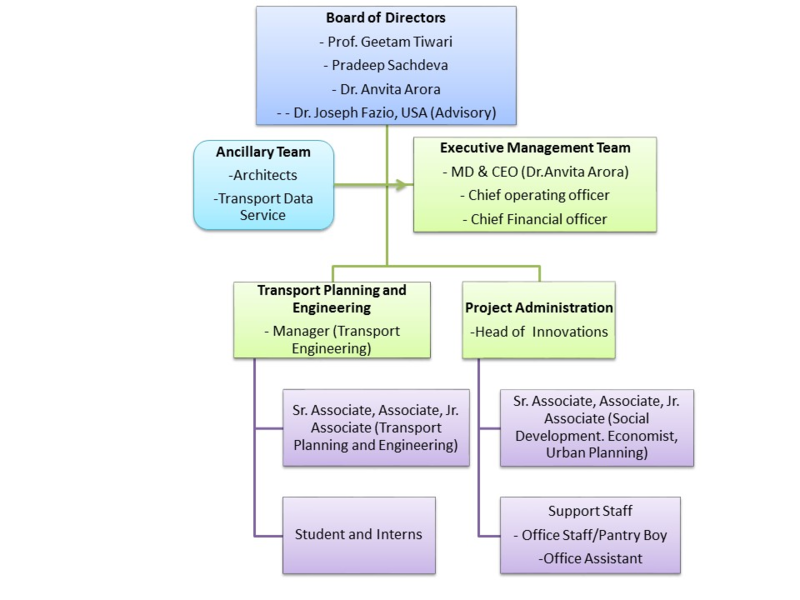 Ltd. Our work Deloitte India Ltd., is regarding the institutional restructuring of Institute of Urban Transport-India (IUT-India), the transport arm of the Ministry of Urban Development. At the city level, we worked with government bodies like the Central Public Works Department (CPWD), RITES Ltd., Delhi Development Authority(DDA), Municipal Corporation of Delhi(MCD), Bihar Rajya Pul Nirman Nigam, Patna, The Naya Raipur Development Authority (NRDA), Raipur on projects involving Comprehensive Mobility Plans, Bicycle Master Planning and Design, Feasibility for a BRT system, Area level traffic circulation plans and other microscopic traffic engineering and design projects. Our international clients include organisations like the World Bank, Asian Development Bank (ADB), UNEP-Risoe Centre Denmark, Interface for Cycling Expertise (I-CE) Netherlands, Institute for Transport and Development Policy (ITDP), International Council on Clean Transportation (ICCT), UN-Habitat Kenya, Clean Air Initiative- Asia (CAI-Asia), for whom we worked on projects relating to development of a cycle inclusive planning manual for the Indian Sub-continent, planning and design of cycle tracks, Promoting the Low Carbon Transport in India, Case studies regarding 2-Wheelers and 3-Wheelers in India at the transport policy level and Non-Motorised transport at the traffic engineering level. We worked with institutes like INTACH and Aga Khan Trust for Culture (AKTC) on the traffic engineering and designs for mobility in heritage areas like the Shahjahanabad and the Humayun Tomb in Delhi. iTrans also works with various civil society organisations and provides them with technical assistance in their efforts to promote Sustainable transport in Indian cities. We work with NGOs like the Institute for Democracy and Sustainability (IDS) in Delhi, Parisar and Centre for Environment Education in Pune and are also part of a network of NGOs promoting sustainable transport in various parts of the country, called Sustainable Urban Mobility Network (SUMNet).